Sullivan’s Naim Thomas and Kyla Given were selected to the All-American Teams. Thomas was selected to the NJCAA Division III Men’s Basketball First Team All-American. Thomas was named the Mid-Hudson Conference Most Valuable Player and Region XV Player of the Year this year. He also garnered Player of the Week and the Conference Athlete of the Week honors. Given was selected to the NJCAA Division III Women’s Basketball Honorable Mention All-American Team. 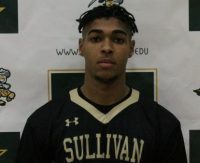 Given was named the Mid-Hudson Conference Most Valuable Player and was selected to the All-Region Team after leading Sullivan to Region XV Crown and a National Tournament berth.